Dentium's DASK is a comprehensive solution for easy and reliable sinus lift and elevation procedures. Dentium's new sinus elevation kit DASK (Dentium Advanced Sinus Kit), offers clinicians a simple, conservative technique for reliable sinus elevation procedures. Instruments included in the DASK provide straightforward exposure to the sinus cavity, reducing chair time and decreasing post-surgery discomfort for patients. When used with Dentium's OSTEON Sinus or OSTEON Lifting synthetic bone graft materials, clinicians have the ability to perform well-controlled maxillary sinus augmentation. 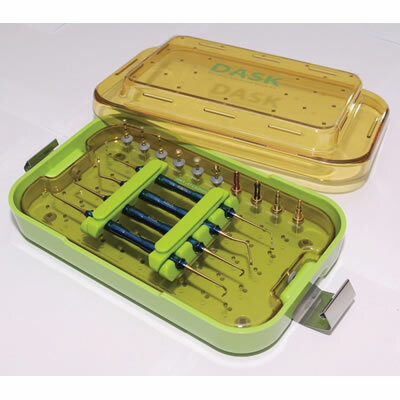 The DASK's diamond-coated drills are designed to help prevent sinus membrane perforation as well as provide an optimal irrigation function. The drills cool the bone through internal irrigation, and hydraulic pressure slightly lifts away the sinus membrane from the drill for added safety.